Eurocoils produce coils to the highest and most demanding UK and continental specifications, whether a customer's requirement is for one or for many. Quality control procedures certified to ISO9001 ensure consistently high standards of production. Coil designs are determined via a bespoke computer programme developed specifically for Eurocoils to ensure equipment is quoted quickly and accurately and is the most cost effective solution to meet the particular requirements and specification of each customer. 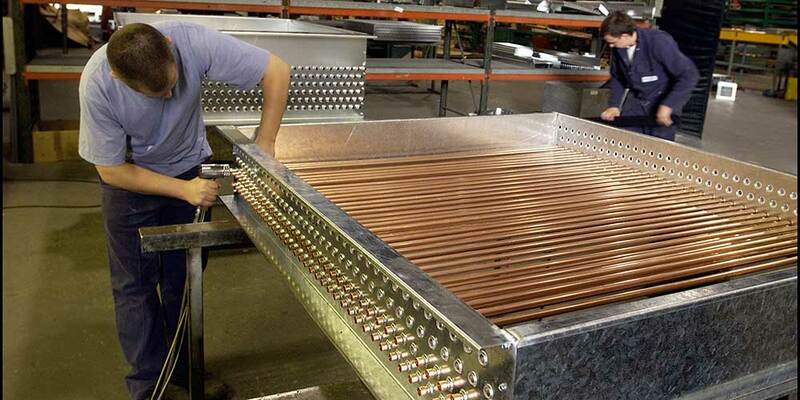 Heat transfer coils can be supplied for duct mounting or Air Handling Unit applications. Coils are manufactured from 9.5, 12.7 or 15.9mm o/d copper, cupro-nickle or stainless steel tube, varying in thickness from 0.5mm to 0.9mm. Tubes are expanded onto fins that can be supplied in aluminium, polyester-coated aluminium, copper or stainless steel, copper fins can be electro-tinned if required. Fin spacing can be varied from 160 per metre to 400 per metre to give optimum coil performance and cost efficiency. The fin thickness can be varied up to 0.4mm to suit a wide range of specifications. Specialist coatings can be applied to fin facings or complete assemblies. Fin blocks can be supplied in galvanised sheet or stainless steel casings, alternatively casings galvanised after manufacturer are available where required. Condensate trays supplied with cooling coils can be designed for easy removal for cleaning and where face velocities on cooling coils exceed 2.5m/s moisture eliminators may be recommended. Eliminators can be manufactured from polypropylene, galvanised sheet, stainless steel or aluminium. Eurocoils can also supply Electric Heater Batteries, Run Around Pump sets, Pressurisation Sets, Cold Water Booster Sets and Bespoke Packaged Units.